Wow, C.S. Lewis At War by Focus On The Family’s Radio Theatre has so much to like! I recently read C.S. Lewis In A Time Of War (you can read my review of this book by clicking here), so this audio drama was the perfect companion to the book. If you’re anything like me, you might find that when a book is dramatized in a movie or an audio format, you say something like, “That wasn’t how I read that book.” But once again FOTF’s Radio Theatre stays so true to the intent of the story that it’s hard to find any places they departed from the book, the man, or the history of the time. In fact, I’d say the opposite: this dramatization actually brought out some details that the book form couldn’t address as fully. If you like C.S. 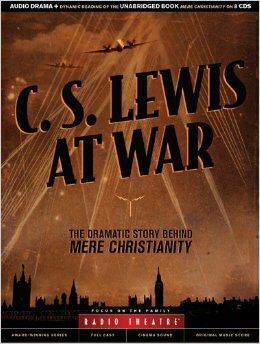 Lewis, old-time-radio broadcasts, history, or just a really well-told story, I think you will enjoy C.S. Lewis At War. Jesus was crucified. He was in the grave for three days. 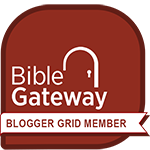 Then God raised Him from the dead, fulfilling everything that had been prophesied about Him! That’s the real Jesus! But those who don’t want to acknowledge those facts have concocted all sorts of conspiracy theories as to His death and resurrection. 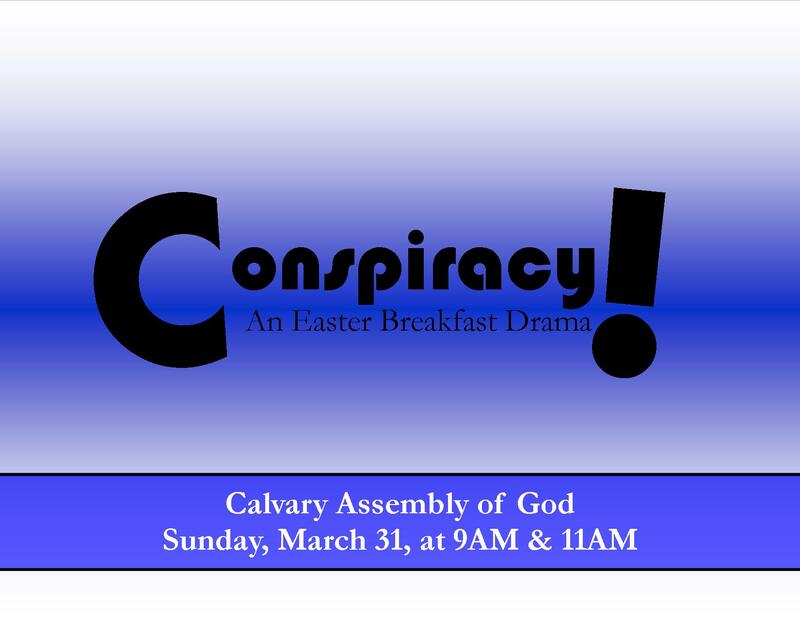 On Easter morning, Calvary Assembly of God will be presenting an original drama called Conspiracy! to tackle these conspiracies head-on. The cast of characters is interesting, the dialogue is witty and fast-moving, so this will be a very memorable morning! When: Sunday, March 31, at 9am and 11am. Where: Calvary Assembly of God. Cost: FREE but we suggest you get a ticket to make sure you have a seat. You can reserve your spot by clicking here and emailing your ticket request to me. A delicious breakfast + some uplifting music + a memorable drama = a great morning learning about the risen Jesus. Please don’t miss it! I’m getting more and more excited about Easter Sunday. Jesus is out of the tomb, so we’re going to do something out of the box. We’ve written an original play called Conspiracy! 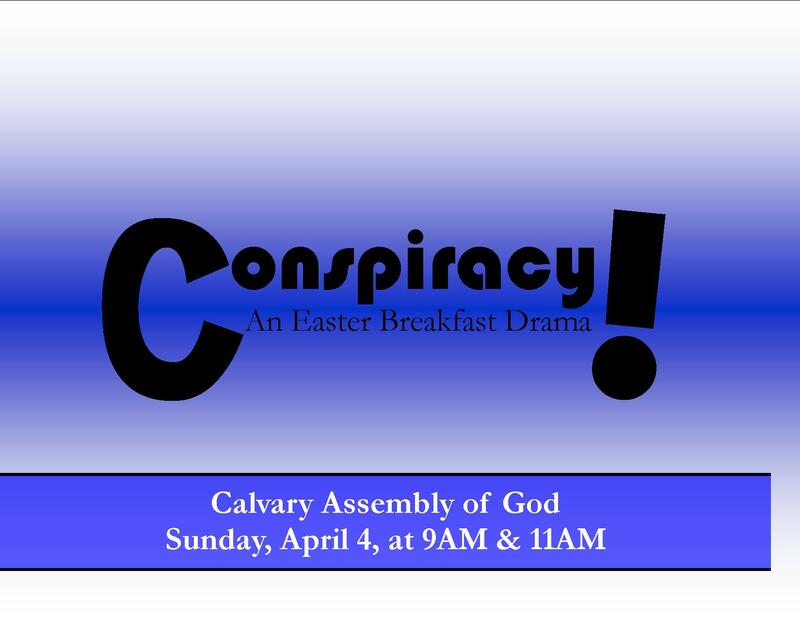 We’re going to present it on April 4 as a part of our Resurrection celebration at our Easter breakfast drama. I don’t want to let the cat out of the bag, but let me just say, this play is going to take a lot of people by surprise. There’s no cost for the breakfast, and we’ll be presenting the breakfast drama twice: at 9am and 11am. If you’d like more information, please leave a comment or email me. Make your plans now to join us… it’s going to be an incredible celebration!